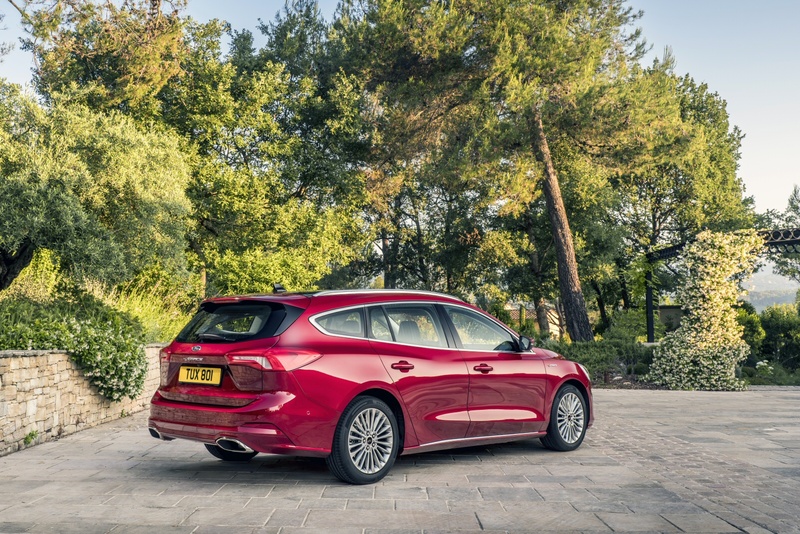 The Ford Focus Estate has been given a proper working over in MK4 form, with more boot space, sleeker looks, a more user-friendly interior, more efficient engines and some suspension tweaks that aim to remind us what made the Focus great in the first place. 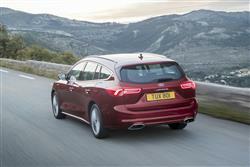 It's not the biggest or the cheapest estate in its sector, but it might just be the most appealing all-rounder. Such is the pull of small SUVs that the estate car seems to have had its last rites read time and again, yet still they struggle on. The reason why they refuse to die? They're a good idea. What's more, if people were honest about why they really needed a vehicle, an estate car would make more practical sense. They carry just as much as many SUVs, yet they're better to drive, they're lighter and more aerodynamic which means better efficiency - and they're usually cheaper to buy too. Ford's brought us some brilliant estates down the years but as much as customers have warmed to the Focus hatch, the five-door estate has never occupied a huge slice of the overall Focus sales pie chart. Perhaps this current version can formulate a more convincing argument. 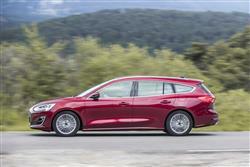 This fourth generation Focus estate, like its predecessors, has a reputation as a family station wagon with the ability to entertain at the wheel - and if you enjoy your driving, that's something you'll appreciate pretty early on the first time you try one. Twenty years ago, the original version of this model achieved much the same thing by standardising advanced multi-link rear suspension across its model line-up. Today, you get that too - in contrast to the hatch body shape which restricts this more advanced damping set-up to its most powerful 1.5-litre EcoBoost petrol and 2.0-litre EcoBlue diesel variants. To give you the engine line-up in full, things kick off with the brand's familiar three cylinder 1.0-litre EcoBoost petrol powerplant, available in 85, 100 or 125PS variants that now feature cylinder deactivation. Next up for petrol people is the 1.5-litre four cylinder EcoBoost engine with 150PS, borrowed from the Fiesta ST hot hatch, this unit also available with 182PS. The Focus ST gets a 2.3-litre EcoBoost petrol unit with 280PS. 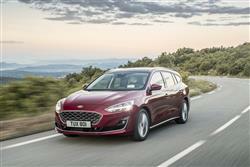 As for diesels, well there are 90 and 120PS versions of Ford's 1.5-litre EcoBlue powerplant, then 150 and 190PS versions of the company's 2.0-litre EcoBlue diesel. The ride isn't overly firm, but body control through the bends is exemplary, allowing you at the wheel to make the most of the stiff new C2 platform, the feelsome power steering and the torque vectoring control system that helps you get the power down through the bends. It all combines to create a car that really can still reward at the wheel, even in its most affordable forms: there's still nothing else in this segment that feels quite the same. Yet it still does the sensible stuff well too, being decently refined, with confident braking and a lovely tactile gearshift. The styling has useful evolved but looks a touch conservative in this station wagon guise. The front of the cabin's of much higher quality than before and comes complete with Ford's latest 'SYNC3' infotainment touchscreen in most models. 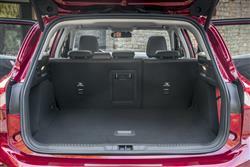 There's space for four adults inside without too much of a squeeze, but levering a third body onto the rear bench will be a bit of a pinch. 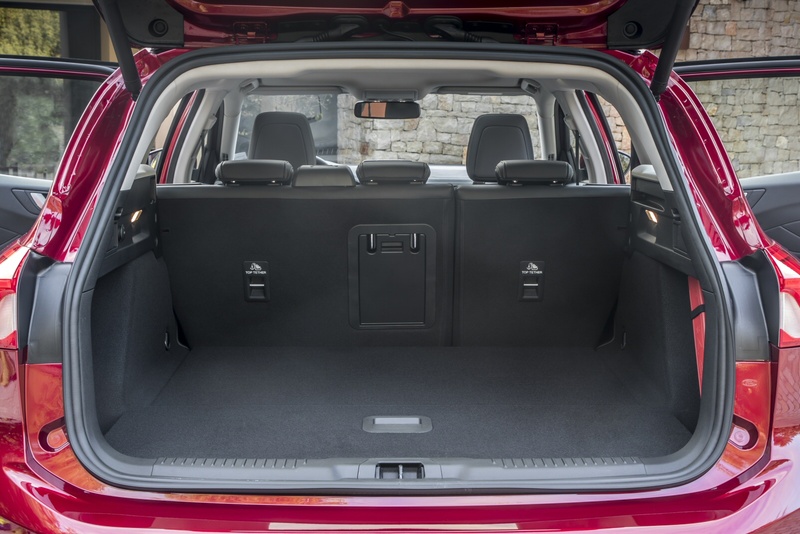 Since this is an estate though, our emphasis needs to be on the luggage bay, which really is a lot bigger than it is in the hatch. A typically-specified estate model fitted with a mini-spare offers up to 575-litres of capacity - or as much as 728-litres if you load to the roof. If you need more room and want to push forward the 60:40-split rear bench, then up to 1,620-litres of space is on offer, thanks to 175mm of extra loading length this time round and an extra 43mm of roof height for this generation model, an increase apparently calculated so as to enable owners to comfortably accommodate a dog crate. 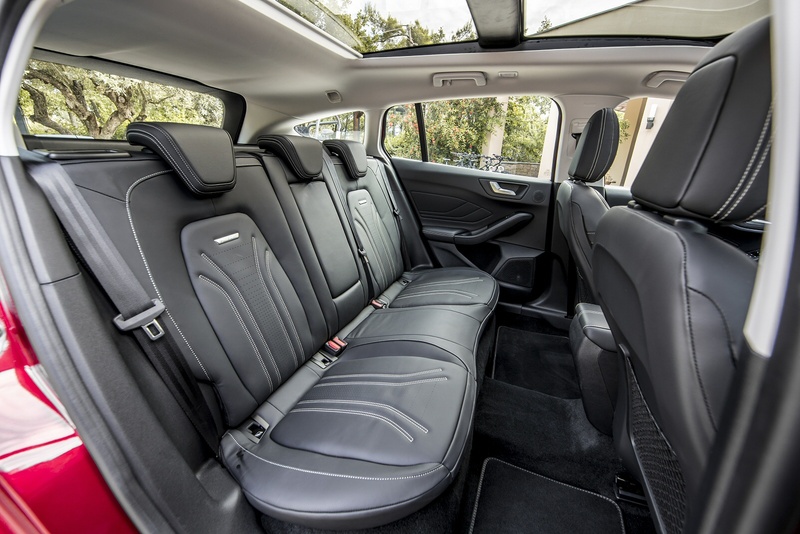 Go for this station wagon variant and auto-folding 'Easy Fold' rear seat backs come as standard, plus you can have a gesture-controlled powered tailgate if you're prepared to pay extra for it. 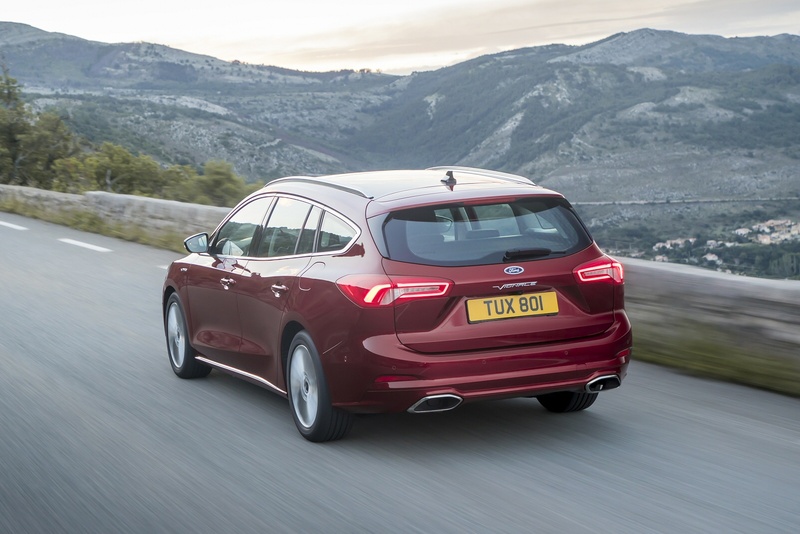 This estate body style attracts a premium of £1,100 over the equivalent hatch. That means starting prices beginning from around £19,400. 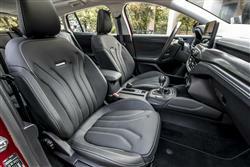 An 8-speed automatic gearbox is an option across virtually the whole range - for an extra £1,450. Ford claims to have reduced the number of orderable Focus configurations by 92% this time round, but the vast model line-up still takes a bit of getting your head around. Basically, in the mainstream range, there are a couple of budget-minded model lines ('Style' and 'Zetec'), then three luxury-orientated variants ('Titanium', the 'Titanium X' version and top 'Vignale'), plus a couple of 'Sport' models ('ST-Line' and 'ST-Line X'). And you can ask your dealer about an SUV-style 'Active' version and a fully-fledged ST fast estate derivative too. 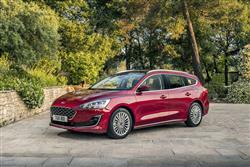 Only the two base powerplants are available with entry-level 'Style' or 'Zetec' trim. Of the two affordable powerplants, most will choose the 1.0-litre EcoBoost petrol option, available with either 85, 100 or 125PS. If you can afford a little more and enjoy your driving, then you can go for one of the more powerful engines that come fitted with more sophisticated 'control blade' multi-link rear suspension package. These include a 150PS 2.0-litre EcoBlue diesel and an all-new 1.5-litre three cylinder EcoBoost petrol option, offered with either 150 or 182PS. Let's get to the figures, which as usual we'll quote using WLTP measurement for fuel and NEDC2 measurement for CO2 - in line with current industry practice. Bear in mind with all the engines that if you choose the optional 8-speed auto gearbox, you'll hit your efficiency readings by around 10% - which isn't the case if you go for a Volkswagen Group model with DSG auto transmission. The 1.0 EcoBoost petrol unit that most will choose comes in three forms with 85, 100 and 125PS, all of which return up to 48.7mpg on the combined cycle with respective CO2 readings of 110, 107 and 108g/km. For the 1.5-litre EcoBoost petrol engine, the figures are up to 45.6mpg and up to 125g/km of CO2. Or 42.8mpg and up to 129g/km of CO2 for this engine in its uprated 182PS state of tune. What about the diesels? Well, for the 1.5 EcoBlue unit in its base 95PS state of tune, you're looking at up to 62.8mpg on the combined cycle and up to 96g/km of CO2. Or up to 61.4mpg and up to 97g/km with this engine in its 120PS state of tune. For completion, we'll also give you the figures for the 2.0-litre EcoBlue diesel variant - up to 56.5mpg and up to 117g/km. If you�re looking for a new Ford Focus 1.0 EcoBoost 100 Style Nav 5dr Petrol Estate for sale, you�ve come to the right place. At Bristol Street Motors we don�t just have the best Ford Focus 1.0 EcoBoost 100 Style Nav 5dr Petrol Estate deals, we also offer friendly advice and help with all your enquiries to ensure your buying experience is a happy experience.